Limited quantities available of this first wine of the season at Montpelier Liquors. There's a new libation in town in the form of spiked seltzer. Hard seltzer was a $60 million industry heading into last summer, according to Nielsen data. Now by some estimates, the industry is hovering around $500 million in sales. Here's why experts say that hard seltzer is about to be the alcoholic beverage for the summer...and perhaps the rest of 2018. It’s hard to beat a cold beer straight from the cooler on a hot summer day, or a chilled poolside cocktail. But it’s also hard to avoid the bloat that comes along with their high calorie counts. Cue hard seltzer—a refreshing alternative which, with fewer calories and about half the carbs of beer, has been getting some buzz as the health-conscious alcoholic beverage of the season. Another bonus? Because hard seltzer is low in sugar, it’s less likely to lead to killer hangovers. The drink came on the scene in 2013, with the creation of SpikedSeltzer. Its immediate popularity has since spawned other brands, such as White Claw, Nauti, and Truly Spiked & Sparkling. Expect to see other companies popping up over the next few months—this trend is here to stay. Whisky enthusiasts agree on many things, but they love to argue about peat smoke. As chili peppers are to spicy food, peat is to whisky. Just as people boast of their tolerance for hot peppers in, say a bowl of chili or a fiery vindaloo, whisky drinkers and producers enjoy out-peating each other. All the while other whisky connoisseurs prefer their unsmoked dram, thank you very much. Many whisky fans enjoy both, of course. But they will always inevitably meet the staunch defenders of both sides of the smoke line. Why is peat in the whisky in the first place? Peat is a type of soil consisting of partially decayed vegetable matter, found in wet, boggy areas known as ‘peatlands’ or ‘mires.’ The predominant component of it is a type of moss called Sphagnum, which gives it that characteristic, sort of rubbery smell, especially when burned. Dried peat has been used as an effective fuel and heat source in place of wood for centuries, particularly in Ireland, Scotland, England and Russia. Two of the biggest misconceptions for novice whisky drinkers are that all Scotch is peated, and that it’s only found in Scotch. Peat comes into whisky production as the fuel source for drying barley or other grains (but mostly barley) for malting. However, the grains can be dried without the use of peat, either simply by letting them air dry, which takes quite a long time, or using unpeated fuel such as certain types of wood. Furthermore, not all peated whisky is the same. You might have rolled your eyes a few times hearing a wine enthusiast use the term terroir to describe the differences between grape varieties in different regions and how that affects the characteristics of specific wines. The same holds true for whisky. Aside from the type of oak used to age a whisky, the other factors that shape the flavors of whisky are the water source, the soil and how the grain was processed, i.e. whether it was peated, which, by the way, is not restricted to Scotland, although that is where the style is most prevalent. In the Highlands and other parts of Scotland, if used in production (there are many who don’t), the peat, which is found farther inland, lends more of a rich, sweet smoke, more reminiscent of pipe tobacco and even smoked or barbecued meat. 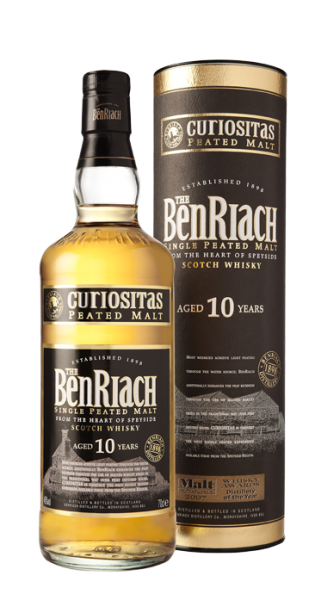 Some of the peated Highland malts to look out for are Glendronach, Oban, Benriach, Benromach, Old Pulteney and Clynelish. Highland Park from Orkney has a very subtle charcoal smokiness, while Talisker from the Isle of Skye uses peat smoke as a more dominant element. Single malt whisky production is catching on outside the UK and Ireland too, even in nations that don’t use peat as an everyday heating source. McCarthy’s out of Clear Creek Distillery in Oregon uses peated barley sourced from Scotland to produce single malt whisky on American shores. Corsair Triple Smoke incorporates peat-smoked barley with cherry wood and beechwood smoked barleys for just a waft of peaty funk. Indian whisky company Amrut is also in on the peat game. Peated Japanese whiskies are of course a thing too. So just because you might have tried a peated whisky and not fallen madly in love, it’s worth tasting others. It’s like saying you don’t like Chardonnay because it’s too “oaky.” No. Oak is oaky. Peat is peaty. It’s all in how a producer chooses to showcase it and which one works with your palate. And you can’t argue that. Cheers !! Confusing, yes. But at least we have one thing clear—we know that blended whiskies, however long they’re aged or finished, always combine single malt and grain whiskies. And we know that single malt whiskies are always the product of one distillery. And we know that we could probably use a tumbler of either one right about now… CHEERS !! For the most part, either will do. Traditionally, ‘whisky’ is the British spelling, and so whisk(e)y that is distilled in Scotland will be labelled as Whisky (the same also applies to Canadian and Japanese ‘whisky’). The American spelling, also used by Irish brands, tends to favor the extra letter ‘E’ as in ‘whiskey’. Most people use the two interchangeably, and you can certainly hold down a verbal discussion without knowing the difference. What is the difference between Scotch and Whiskey? What is Bourbon made from? Why is Rye called Rye? Essentially, all things whiskey-related will come down to four elements: sourcing, mash content, the aging process, and the demographic region in which it is made. Whiskey is an umbrella term for spirits that are distilled from a ‘mash’ of fermented grains. These grains can be many varieties, and often a blend of several, but the most commonly used is corn. To qualify as a Scotch the spirit must be made from malted barley, with many Scotches using nothing more than barley, water and yeast. The spirit must also be aged in oak casks for no less than three years, and must have an ABV between 40% and 94.8%. Finally, you cannot call your drink Scotch unless it was made 100% in Scotland. There are regions galore in Scotland, which all lend their own distinct tastes. Bourbon whiskey must be made from a grain mixture which is at least 51% corn. The fermentation process for this is often started by mixing in some mash from an older already fermenting batch, a process known as sour mash. Bourbon can be made anywhere in the United States, but is strongly associated with the south. The spirit must be distilled to no more than 80% alcohol or 160 proof in new charred oak barrels. Rye is the trickiest of all whiskeys to define. You would assume that Rye whiskey is any booze distilled from only fermented rye mash. However, American Rye needs only 51% rye grain, and the only rule to label your whiskey as Rye in Canada is for it to have “some” rye in it, and to possess the aroma, taste and character generally attributed to Canadian whiskey… whatever that may be to you.